I have been spending new year 2015 in Burnham-on-Sea in Somerset. Clearly one ought not ever to be in Somerset without sampling a little bit of the cider. And so, of course, I did. Rich’s cider is as local to Burnham as it gets. It comes from Watchfield, in Highbridge, which is right next to Burnham. It has been produced there for over 50 years. 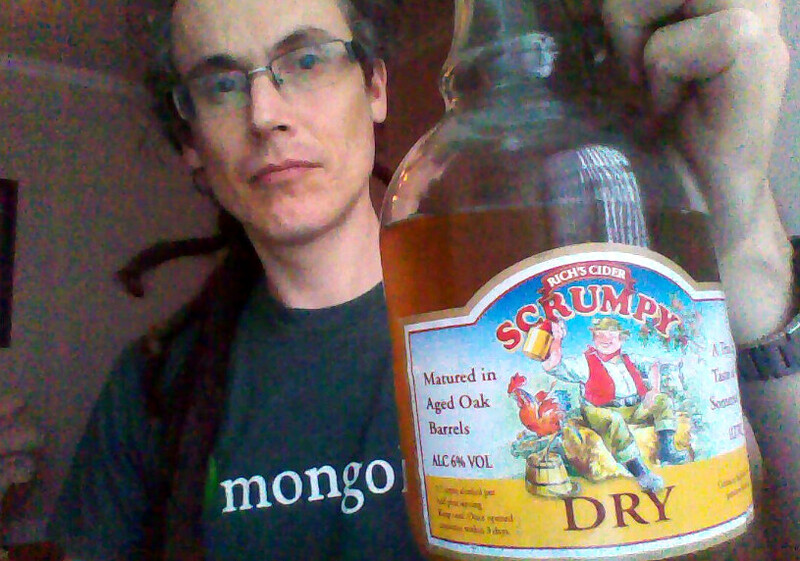 I opted for Rich’ Scrumpy. There are sweet, medium and dry variants. I generally go for dry and so chose that. The cider comes in a 1 litre glass flagon. The label features a sort of jolly cartoon yokel in bright colours. The cider itself has a pleasing amber colour, it is fairly cloudy and pours still. The smell is very cidery. Lots of oakiness and old leather. It is aged in oak barrels, so that adds up. Sipping the cider is a very pleasant experience. I was expecting it to be rougher from the aroma. But it is rounded and pretty smooth. Very enjoyable. It is only 6%, but there is enough depth and complexity in the flavour that it tastes stronger. Being so smooth and rounded, Rich’s Dry Scrumpy cider would make an accessible gateway cider. Bear that in mind should you ever be inducting a neophyte into the ways of the nectar of the West Country.